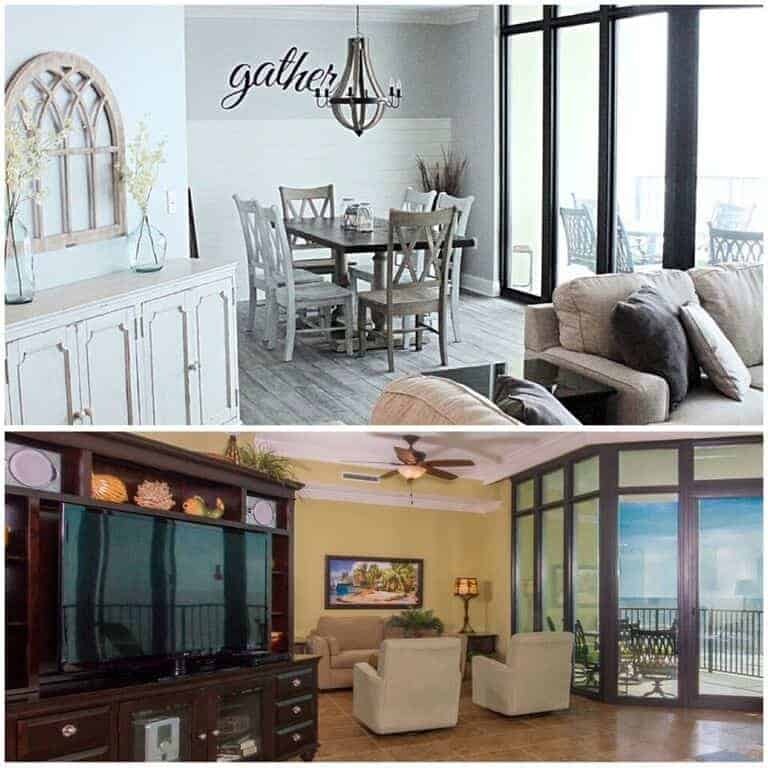 With spring just around the corner and the winter blues headed out, it’s time to spruce up my space with some new decor. 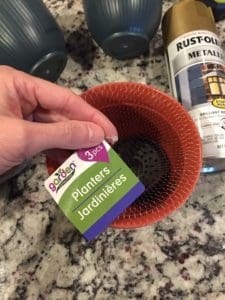 I figured what better way than to bring the outdoors in with a little DIY hanging planter project. I’ve gathered up all my supplies and you’ll never guess where I found them….The Dollar Tree! I love an “indoor garden,” but I don’t have a green thumb. 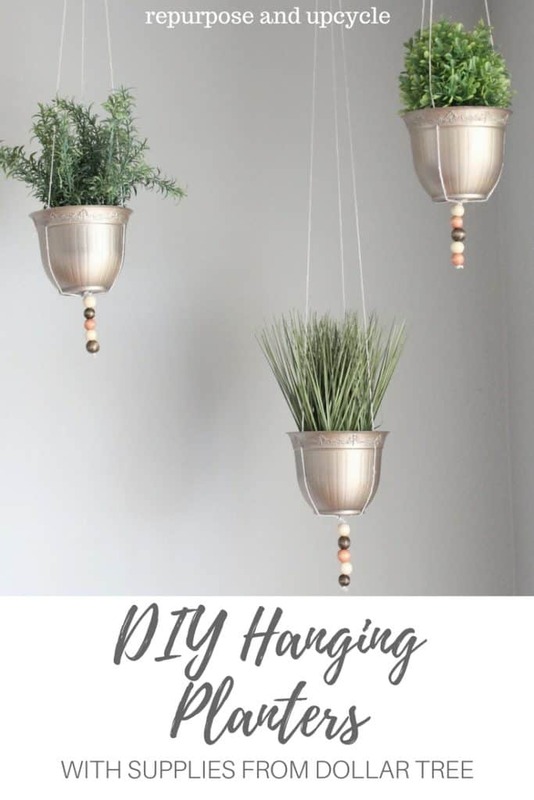 Check out how I created these easy DIY hanging planters with faux plants. You are also in for a treat because I’ve joined a few other talented bloggers for a spring blog hop! If you’ve joined me from Leslie’s blog, My 100 Year Old Home, then welcome. It seems that boho style is on the trend these days. I’ve started seeing a lot of macrame and woven patterns, and I have to say I’m loving it. Even though I do still prefer a vintage, cottage style, I wanted to add a little boho vibe to my home. Since I’m currently loving gold tones, I figured I would start this DIY project with a little spray paint. Note: some of these are affiliate links. I will receive a small commission if you purchase from one of these, but rest assured you will not pay any more for the product. 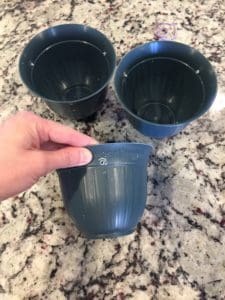 Planter pots of your choice – I got mine at the Dollar Tree three pots for only a dollar! 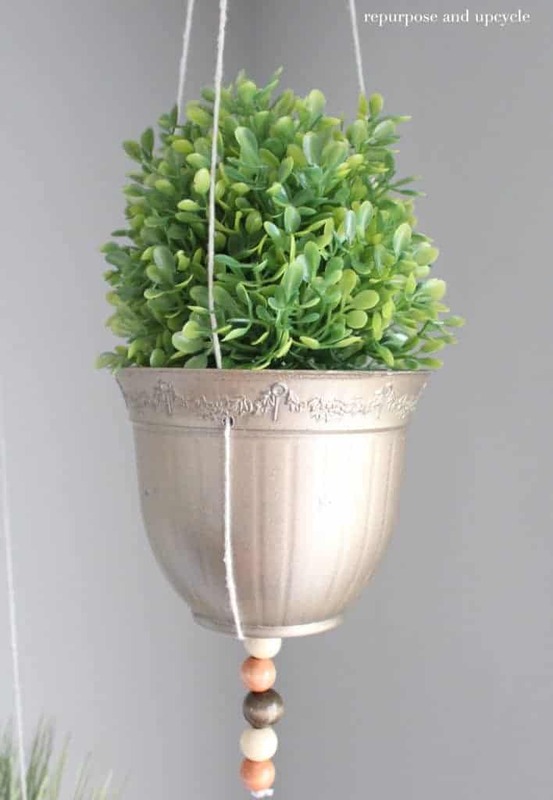 I finally decided which faux greenery I’m going to use for the hanging planters. I chose to spend a little more and purchase already made foliage from Target. 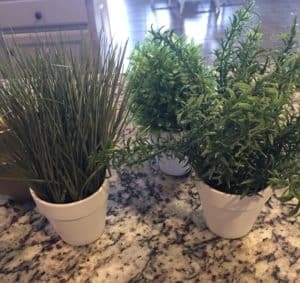 These little planter pots with the different grasses and greenery were only $7.99 each. The fit perfectly inside the dollar tree planters. I figured I could reuse them if I ever got tired of the hanging planters. 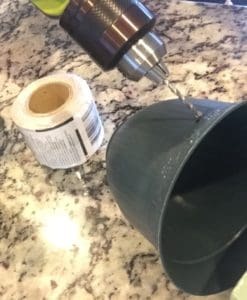 First thing I had to do before I spray painted the planters was to drill three holes in each of them. Once the holes were drilled, it was time to spray paint. Like I said earlier, I wanted to go with a gold color. 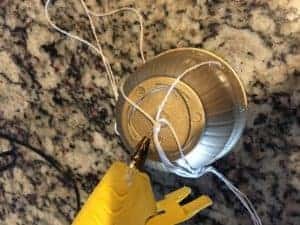 After spray painting the planters, use the yarn to string through the pot. 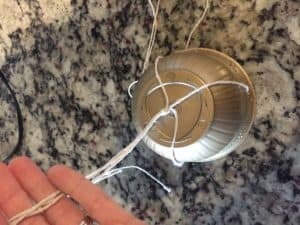 After I strung all the yarn through the holes, I tied them at the bottom of planter and used a little hot glue to secure it. I decided to add a few beads at the bottom to “dress it up” a bit. The simple yarn just didn’t look good. And that’s it! 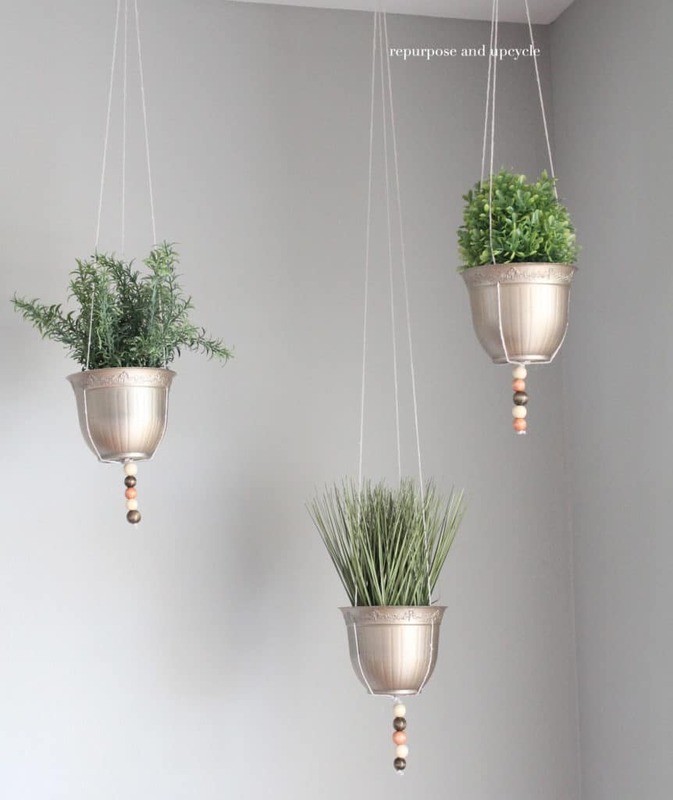 FYI: I hung the hanging planters with a thumb tac. What do you think? I think my DIY planters fit in well with the rest of my dining room! Thanks for stopping to take a peek at my new project. I hope you will stick around and check out some more fun and budget friendly crafts. If you enjoyed this post I would love for you to share it to Pinterest. I hope you’ve enjoyed this simple DIY project guys! P.S. 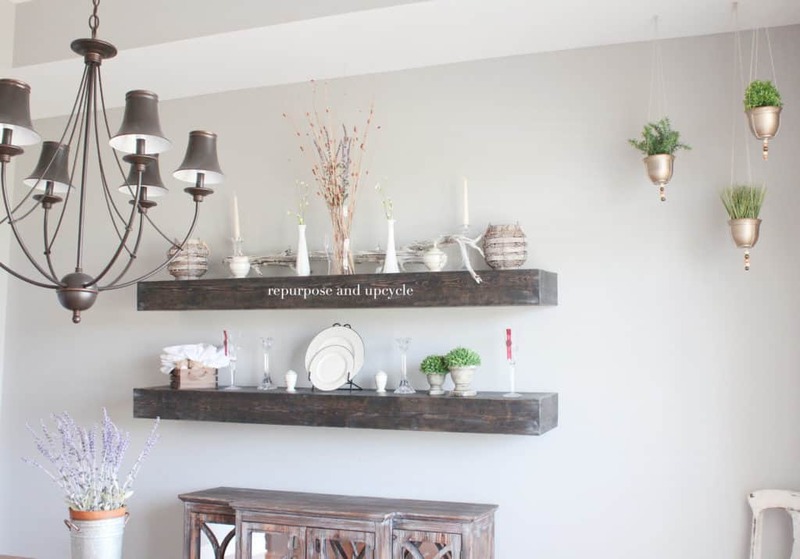 Head on over to Tara’s blog, Pennies From Heaven Home, and check out her amazing spring DIY. Super cute and a great idea! I love the bead detail on the bottom! Lindsey – you never cease to amaze me! 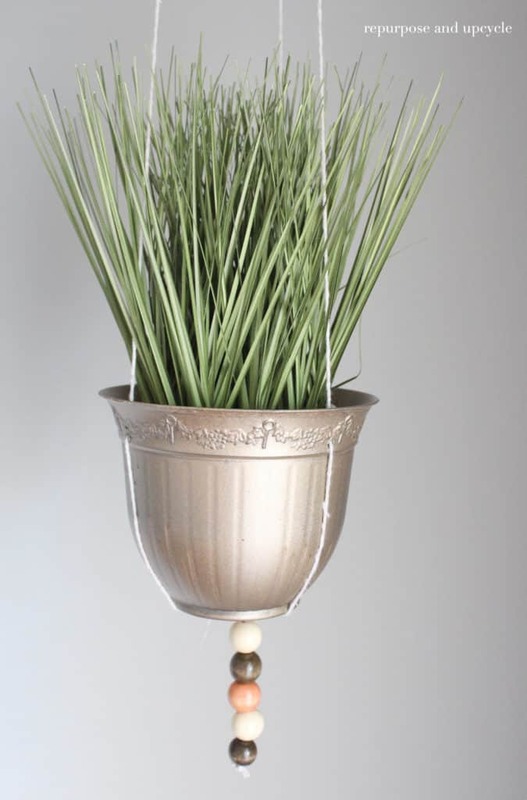 I am loving this tutorial and am looking at corners in my home where I can add this DIY element. Thank you for inspiring me – pinned and shared! You are so creative! I love these hanging plants! Lindsey these are just darling! I love how pretty they turned out and how inexpensive they are! Great DIY! These hanging plants are beautiful, Lindsey! I’m totally with you; I have no green thumb but these faux plants look so real! Your dining are is lovely, friend! Cute! 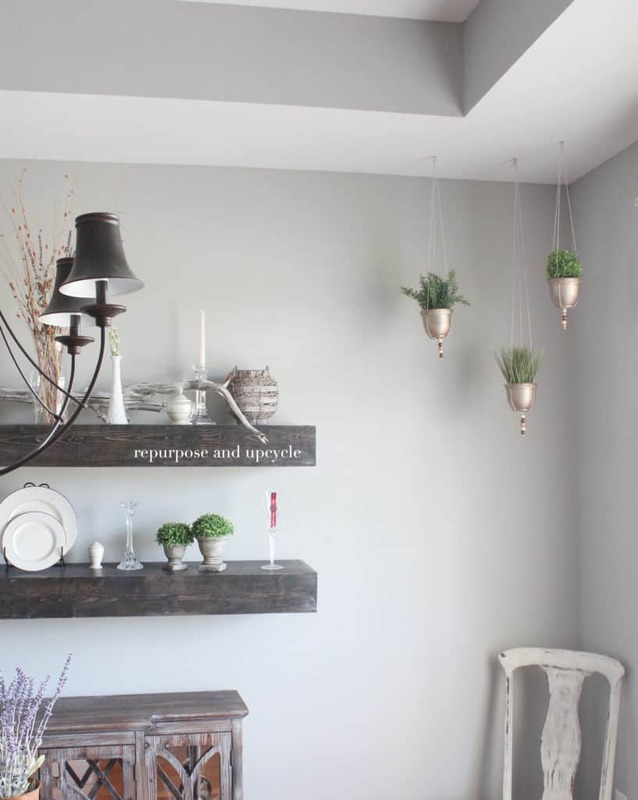 I have been toying with where to add a hanging planter in our home because I love how they look. Visiting from Happiness Is Homemade. That is so cute! I love that all of your supplies came from the dollar store too. I took part in a dollar store craft challenge a week or so ago and I just kept wandering the store wondering what to do. This is a great idea. Pinned. I love this idea but the photos didn’t load on my screen – are they hi resolution? Yes they are high resolution, I’m so sorry they didn’t load. These look great! I love dollar store projects that get a new look. These are so fun and definitely giving off the boho vibe. Can’t beat the dollar store! These are so pretty. Pinning! 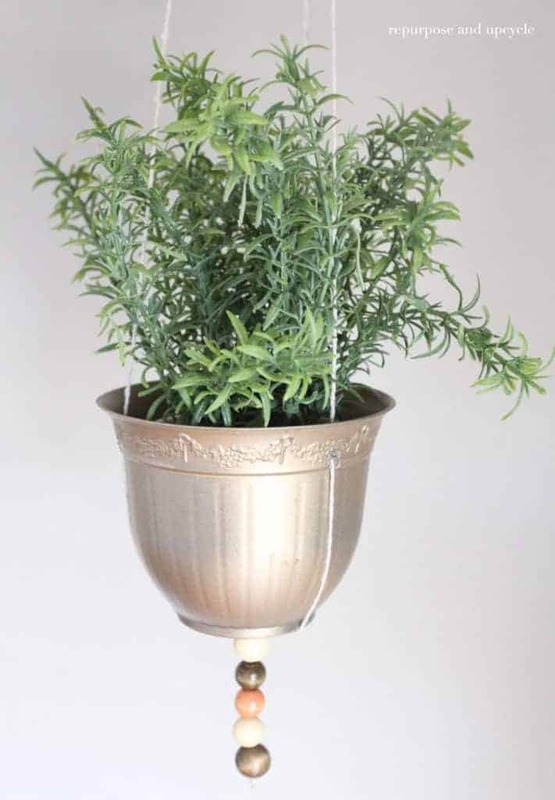 What a lovely way to bring a touch of spring to your home! Pinning and sharing on the Hearth and Soul Facebook Page later today. Thank you for sharing, and for being a part of the Hearth and Soul Link Party. So pretty! With the new color no one will think those are inexpensive planters. Thank you for sharing at The Really Crafty Link Party. Pinned! A blog hop sounds like so much fun, and these are so cute! I am right there with you on the fake foliage-I can’t seem to keep anything alive so I have just stopped trying. Drilling the holes for the twine to go through is genius, too. Love it. Just the perfect touch of greenery. Love the fact that it fits any budget – thanks for the tutorial! I am already thinking about where I can hang these in my home and planning a trip to Dollar Tree. Thanks for sharing a great project. Cute idea! 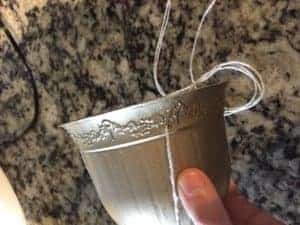 The paint and beads really transformed that pot. Thanks for sharing with SYC. I just love the Dollar Store and making things out of items from there. This is a great up-cycle! Well done! You always have the vest ideas! These look brilliant and perfect for brightening up a home. Thanks for being a part of the #bigpinklink this week. With a bit of imagination, you really can do so much with some Dollar Tree supplies. Love the planters. Thanks for sharing at the inspiration spotlight party. Pinned & sharing. 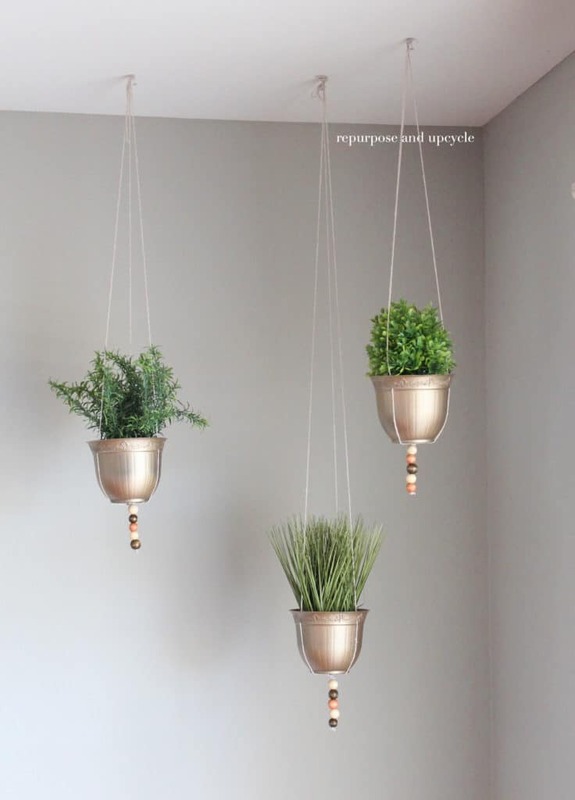 I love your hanging planters. This is such an easy and beatiful idea! Wonderful thrifty boho Decor Lindsey, with a touch of glam! 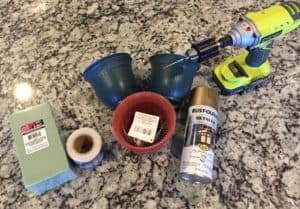 Pingback: 17 Beautiful Spring Home DIY Projects! Do you remember what the color gold you used. It doesn’t seem as yellow as others and I like it. Yes! Here is a link to it. This is my favorite gold spray paint. I’ve used it all over the house.